Monday - Saturday, 12 a.m. - 6 p.m. In the coming two months, visitors will have an opportunity to experience the gallery space at Galerie m without an exhibition. 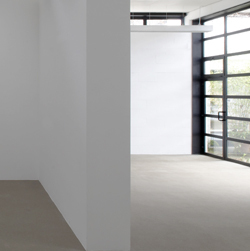 The gallery itself is the focus of Open House – Empty Space, revealing to visitors its many faces. m Bochum Kunstvermittlung as guest at Galerie m with works of the Chinese artist Qiu Shihua. Exhibition of selected works of Peter Wegner. Apolonija Sustersic with kids from Hustadt as guests at the Galerie m Bochum: they create a garden bench for the Community Pavilion at the Brunnenplatz in the Bochum Hustadt. Exhibition of selected works of Aino Kannisto. Exhibition of further information by Caroline von Grone, made at the painting project from 7th to 9th February. The latest news on Open House – Empty Space can be found at www.galerie-m-bochum.de, in our Newsletter (subscribe at: news@m-bochum.de) or on Galerie m’s Facebook page. Or just give us a call: +49-234-43997. Galerie m as a gallery as such becomes most visible through the exhibitions held there, which are usually conceived in close collaboration with the artists. However, the space itself with its inherent qualities always of course cedes the spotlight to the art. The room is the stage, the frame, but as a place also often the catalyst. The unexpected emptiness of the gallery makes it possible to experience the architecture in all its facets: light, spatial volumes and proportions, sight lines, the relationship between indoors and outdoors. But the empty space is also a place of concentration, tranquility or encounters with others, for which new room opens up when the art is absent. Artists and gallerists, but gallery visitors as well, seem to continually find new and surprising ways to deal with our exhibition space. During the show Open House – Empty Space the gallery is a setting for presentations, happenings, performances and encounters. The concentration on individual aspects of what happens at the gallery, and unexpected events outside the exhibition routine, provides a new way of seeing the exhibition space, its traditions, its present-day status and the expectations tied to them. At the same time, Open House - Empty Space gives people a chance to pause and reflect – not only on the past fortunes of the gallery space within the context of art and architectural history, but also looking back over the individual history of Galerie m. Since its founding in 1972, the gallery has been an exhibition location with a clear program, one encompassing various artistic positions. Exhibitions at Galerie m often debut an artist’s latest work. Works are also frequently executed expressly for exhibitions planned here, conceived with the rooms in mind. Proximity to the artist, to the studio, is an essential aspect of our self-image as a gallery. All the same, the possibilities for spontaneous, experimental presentations, performances and events remain limited within the framework of the exhibition routine. In the coming weeks we want for a change to make space for exactly such activities. In a painting event, Caroline von Grone will use Galerie m as her studio, executing a portrait at the gallery. 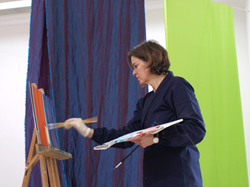 Along with a performance by Barbara Köhler there will also be a film presentation featuring works by Melanie Manchot. 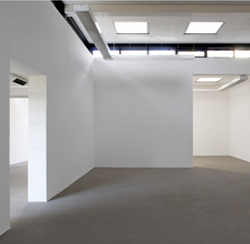 Open House – Empty Space will in addition focus in on individual artworks and their interaction with the gallery spaces. 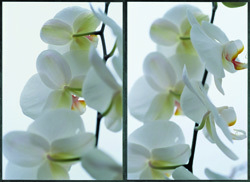 Instead of a number of pictures, just one single work will be positioned in the gallery setting. A concentrated and intense experience of and through art is what makes Galerie m such a special place. 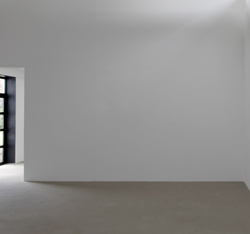 Open House – Empty Space is not only a break with the daily exhibition routine, but also a question posed to the gallery space about its potential and possibilities.